Think about the childhood game we have all played or seen at one time or another - Pin the Tail on the Donkey. Did you ever wonder where it might have originated? Our bet is on a phenomenon that occasionally crops up in donkeys. 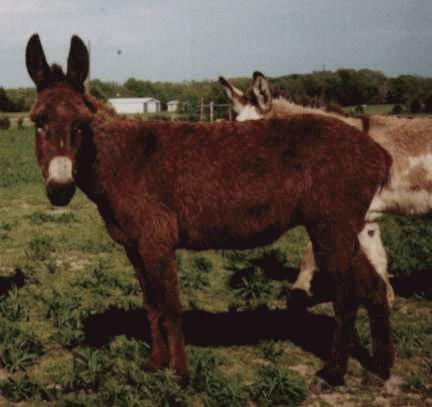 Some donkeys (in all sizes) are born with no tail, or only a short nub. Donkeys have tails that resemble a cows - long bone, covered in short body hair, with a switch or tassel at the end. Horse's tails have long hair covering the entire tailbone. The draft horses and carriage horses of times past actually had the tails docked (cut off) to prevent the tail hair from becoming tangled in the harnesses. Docking is not done on most breeds any more, and is in fact illegal in some countries. So if you see a donkey with no tail, don't panic. It wasn't cut off - chances are it was born without it. THere are about 10 recorded cases in the over 45,000 records maintained by the ADMS of donkeys with tail-nubs, or no tails. I (Leah) own one of them. There are several tail-less standards, 1 Mammoth, and at least 2 minis. Donkeys who are born with no tail and a DIMPLE at the end of the spine should be examined by a vet and possibly x-rayed. In a conversation with Dr. Tex Taylor, ADMS's consulting vet, he stated he had a Mammoth colt born with a dimple. By the age of 1 year, this colt was beginning to show nerve degeneration and back problems. He euthanized the colt. It is suspected that the dimple was an incomplete closure of the spine, something similar to Spina Bifida in humans. Little donkeys with tail-nubs, or even the slightest hint of a tail should be okay - they just lack their natural fly-switch. We know of only one of the tail-less donkeys that was bred, and the foal also had a shortened tail. This indicated some of the tail problems could be genetic. The rest are either not being bred or the males have been castrated. My own donkey "Rabbit" (WSF Devil's Advocate) was never a candidate for a jack. He was castrated at 11 months. He is a very happy gelding who just has a kinked knot of tailbone over his behind. Interestingly enough, he has about 12-20 long switch hairs growing from the end of the knot. He can move the nub (and often wags it in pleasure if you scratch JUST right...) but it is obviously not long enough to do any good. This phenomenon has obviously occured before. If we have 10 cases in 40 years worth of records, there have to have been other cases previous to this. Perhaps somewhere along the line, someone had a bunny-donkey, and a clever parent came up with a fun party game! We have used Rabbit in the costume class before as a "live" pin the tail on the donkey. My mom, friend Colleen and I dressed up as kids at a birthday party. We led Rabbit, and took turns "pinning" felt tails to him - with velcro ends. A slit blindfold is all you need! Since Rabbit is dark brown, we used red, green and white felt tails to stand out on his dakr coat. The announcer confirmed for the audience that Rabbit was a natural bobtail, not docked, and the audience loved it! You may need to take extra precautions in fly season if you have a tail-less donkey. They will need shelter in the shade where they can get out of the heat and flies, and preferably a companion who is willing to help swish for them!!! Other than making sure the tailless donkey has no actual spinal problems, they can be used like any other pet or working donkey. Until you are sure the defect is just congenital and not genetic, we don't recommend breeding them, but there is no reason not to use them as saddle donkeys, guard donkeys, in harness, or as pets. WSF Devil's Advocate - aka "Rabbit", a natural bob-tail donkey gelding.